Women who receive the human papillomavirus (HPV) vaccine may be more likely to be infected with certain high-risk strains of the virus than women who do not get the vaccine, according to a new study. The findings suggest that, although the vaccine is effective in protecting against four strains of HPV, women who received it may still benefit from getting another, recently approved HPV vaccine that protects against nine strains of the virus, the researchers said. "Vaccinated women who got the quadrivalent [four-strain] vaccine may get the nine-valent [strain] vaccine as further protection for them," said Fangjian Guo, a postdoctoral fellow at the University of Texas Medical Branch and one of the researchers on the new study. Guo noted that this is not an official recommendation, and that more research is needed to confirm the findings. Currently, the Centers for Disease Control and Prevention recommends that girls and young women ages 9 to 26 get any HPV vaccine to protect against cervical cancer, as some strains of HPV have been linked to cervical cancer. The new study was presented this week here at the meeting of the American Association for Cancer Research. It has not yet been published in a peer-reviewed journal. For the new study, Guo and his colleagues analyzed information from nearly 600 women ages 20 to 26, including 80 women who had received the original Gardasil HPV vaccine, which protects against four HPV types -- 6, 11, 16 and 18. There are many types of HPV, and some can lead to cervical cancer if the body does not clear the infection after many years. HPV types 16 and 18 cause the majority of cervical cancers. Women in the study who received the Gardasil vaccine were, indeed, less likely to be infected with the four strains of the virus included the vaccine: About 11 percent of vaccinated women were infected with HPV 6, 11, 16 or 18, compared with nearly 20 percent of unvaccinated women. It's unclear why the vaccinated women were more likely to be infected with other high-risk strains, the researchers said. The new findings suggest that women previously vaccinated against HPV may benefit from a new HPV vaccine, called Gardasil 9, which protects against the original four strains plus five more strains (31, 33, 45, 52 and 58) of HPV that cause about 20 percent of cervical cancers, the researchers said. 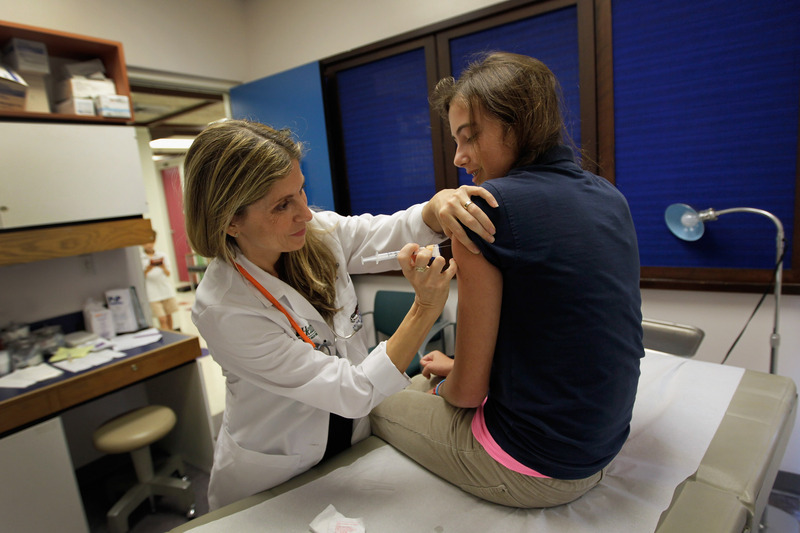 Gardasil 9 was approved in December 2014 for women ages 9 to 26. And if a woman is already infected with HPV, the HPV vaccine cannot eliminate this infection, Guo noted. Younger women and girls who have not acquired an HPV infection would benefit most from the new vaccine, Guo said. Because the new study looked at women at one point in time, the researchers could not determine women's risk of going on to develop cervical cancer. However previous studies have found that the HPV vaccine lowers the rate of precancerous lesions in women who are vaccinated. Studies that follow women over time would be needed in order to determine women's risk of developing cervical cancer if they were vaccinated but were to still become infected with a high-risk strain of HPV, Guo said. The new study "highlights the need to continue to pursue additional strategies to control HPV infection," said Dr. Kunle Odunsi, deputy director and chairman of the department of gynecologic oncology at Roswell Park Cancer Institute in Buffalo, New York, who was not involved in the study. "We need to remember that there are more than 80 HPV types, and some of them can still be associated with risk of cervical malignant disease," Odunsi said. Future vaccines could include even more strains of the virus, Odunsi said. Based on the new findings, Odunsi said that, in his opinion, women who received the quadrivalent vaccine should probably get the nine-valent vaccine. Dr. Shashikant Lele, clinical chief of gynecologic oncology, also of Roswell Park, said he would like to see the new findings replicated, because it's not clear why women who were vaccinated with the quadrivalent vaccine would be more prone to other HPV infections than women who had not received the vaccine. "That doesn't make sense to me," Lele said. In addition, it's not clear whether women who received the quadrivalent vaccine would benefit from the nine-valent vaccine, so studies need to be conducted to test this hypothesis, Lele said.